I’ve been trying to write a post. I really have. And I really want to. I just don’t know what to say. This has been such a long journey with so many great moments, so many accomplishments and so much change. So much of it unexpected. So much of it beyond what I imagined. And the goal, the culmination of all my hard work, dedication and unwavering focus, is two days away. It’s an overwhelming feeling. It’s exciting. And I’m a big ball of nervous energy right now. I know two things in this moment. One. I did everything I set out to do and so, so much more. I couldn’t be more amazed at how different every single thing in my life is. And two. On Sunday I will become a triathlete. It’s impossible to get through life without the help of those around you. Not necessarily because you couldn’t, but because you just don’t. Help comes, sometimes unspoken, in hundreds of large and small ways, all the time. Maybe it’s only me that takes each step when I go for a run- no one is physically helping me move my legs. Maybe my motivation comes from something inside me- no one tells me what to do. Maybe this whole thing is about me- my idea, my plan, my goal. After all, didn’t I say that the whole reason I chose this goal was that it had nothing to do with anyone else, only me? But that does not mean that no one is helping me. Each and every step I’ve taken– both literally and figuratively– has been backed by the support of so many wonderful people. Could I have done it without them? Yes. But did they help me do it? Absolutely. I could have done it without them, but it wouldn’t have been the same. Sometimes getting help seems like a bad thing- like you can’t do something on your own. But that’s not true. When people want to help you and support you not because you asked for it, or even because you need it…it’s a wonderful thing. So. I moved my own feet. And here’s to some of the people who made that possible. Amelia. I have no idea how I have not mentioned you here before, because without you no one would not be reading these words. You’re the one who put the blog bug in my head, and I am so thankful. Besides that, you’ve been one of my most positive supporters, and have listened to my crazy thoughts more times than I can count. Thank you so, so much. Audrey, your seemingly crazy idea to do a 5K before the tri has changed my life tremendously. Thanks for patiently re-teaching me how to swim and for always having the sweetest most encouraging things to say. Thank you. Because of you, I will not drown. Callie and Wayne, I don’t care if you hate your blog names. I love you. Thank you for running with me. And thank you for always being truly happy for me, and for believing in me and in every aspect of my future. Lola. I cannot imagine what the past few months would have been like without you. I would have definitely puked before the first 5K (and it might have been my last), maybe even cut out of the gym early some days and would not have given myself over to the idea of dating as easily. And I would have had a lot less fun. I don’t know how else to say how happy I am that you came on this journey with me….thanks for being the yin to my yang. James….it’s still beyond words. Thanks for reading this, understanding me, and then doing something amazing. You made me realize that it is possible to do something for yourself that can truly reach other people. And speaking of beyond words– thank you for the bubble. Piz, you believe in my words with such a conviction that I can really see myself on Oprah someday. I promise I’ll figure out a way to get you on camera too 🙂 Thanks for training with me, for coming to see me run, and oh yeah, for being the best brother in the whole wide world. Mom & Dad, thank you for… everything. For being there. For believing in me. 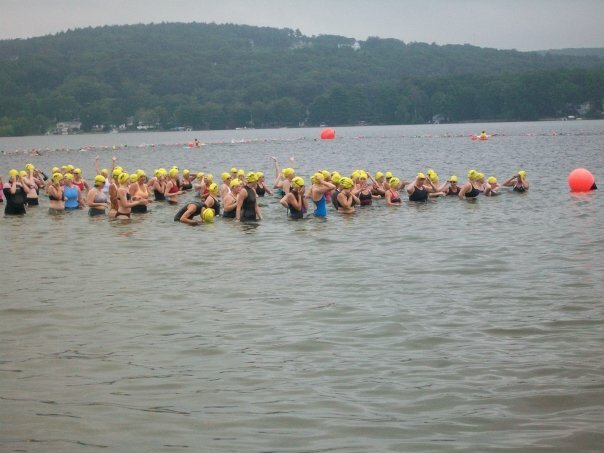 For laughing when I told you I was going to do a triathlon, because it reminds me how far I’ve come. I just had to say all these thank you’s now, because I’m hopping on a plane to Mexico in the morning and I know that once I get back they days will fly by and it will suddenly be the day of the triathlon. I wanted to say these thank you’s before then so that when I cross the finish line each of you will know the role you played in getting me there and the gratitude I have for it. Because let’s face it, I’ll probably be so exhausted I won’t be able to breathe or form a coherent thought to thank you then. I can’t wait! 16 days! Yesterday was a really hot day and the sun was blazing, so naturally that was the day I had to leave work to take a trip to a local historical society to get some images for a project we’re working on. Whatever idea you have in your head of a historical society, I bet you’re right. It was just like that. Hot, lots of stuff, old smells, and no fresh air to breathe. I didn’t even have a chance to recover because when I got back to work I found out this was also the day that the air conditioner decided to break. I spent the last two hours of work trying to cool myself down. It was not just that it was hot. It was that it was stuffy. It was stifling. By the time I walked out at 5pm, I felt like I could barely breathe. I got into my car (which was even hotter and more suffocating) and the feeling didn’t go away. Even after the air conditioning kicked in. Even after I drank a bunch of water. Even once I was halfway home. The feeling seemed disproportionate to the actual temperature displayed on my dashboard. It was making me nervous. Panicky. And then I realized– this is what I used to feel like every day. I had to give that thought a moment. Wow. I used to feel this way all the time. In the winter, having nothing to do with the heat. On a normal day, when nothing in particular was wrong. My mind’s own constant revolution would cause the elephant to creep up and sit on my chest. Or it just never left. I could never breathe. I don’t know how I got that way.